May I broach a subject? 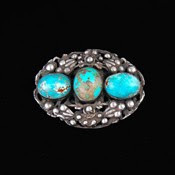 Brooches are the calfskin gloves of the jewelry world, a specialty not to everyone's taste, but deeply pleasurable once you make their acquaintance. They are slipping back, under fashion's scrutiny, but for those collecting jewelry, vintage brooches are still brilliant buys compared to other pieces. Rings, especially engagement rings, are frequently overpriced. 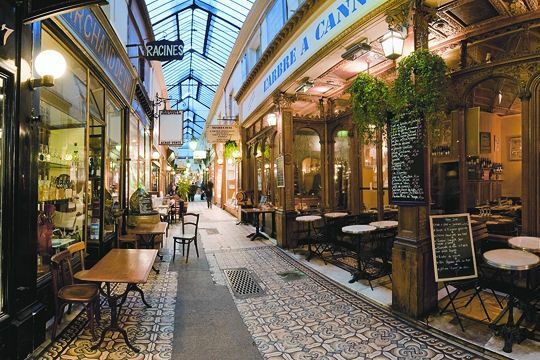 The merchant counts on the pull of social custom and the power of marketing. Earrings? Think about it: you need two of everything. And you don't even see them on. Bracelets? Well at least you see them, but that's a lot of real estate. Brooches (or pins, if you prefer) were rather out of favour with the mainstream and I hope they slip back into semi-obscurity. When I see an entire page in InStyle devoted to brooches, I hiss, get away! Like teacup poodles in handbags, thanks a lot, twenty-somethings, for appropriating the purview of grown women. By which I mean, the noble metals and stones or organic materials. I'm especially drawn to brooches from the latter part of the 19th and earlier part of the 20th century: Victorian, Edwardian and Deco pieces. Since many assume a brooch requires a jacket, I'm showing examples you could wear with a sweater and pants or a simple dress. 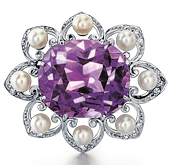 This antique Edwardian amethyst and pearl brooch is under $5,000 (the web site gives price ranges only) from S.J. Shrubsole. It contains a luscious 12ct. amethyst surrounded by seed pearls and diamonds. 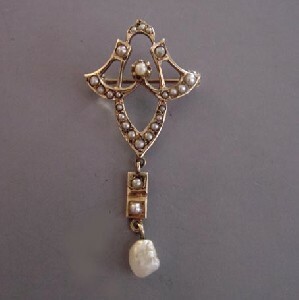 A delicate Edwardian 14k seed pearl and pearl brooch, 1 5/8 inch, conveys discreet Merchant & Ivory charm; price, $235 from Morning Glory Antiques and Jewelry. Really, why buy costume? 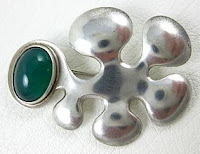 Lovers of modern pieces, here is a rare Georg Jensen biomorphic pin with crysoprase, 5/8" long x 1 1/4" wide, $995 from Trocadero seller The Lush Life Antiques. Bar pins ease you into brooches if you are worried about too much flash. For our blogfrien d hostess of the humble bungalow, I would select this ca. 1900 Arts and Crafts blue chalcedony and aventurine quartz pin set in silver; price, $230 from Trocadero seller Period Pieces. An enc hanting 1 1/4 inch (diameter) Victorian seed pearl brooch from Beladora II; such marvelous design and charisma in this piece; price, $395. 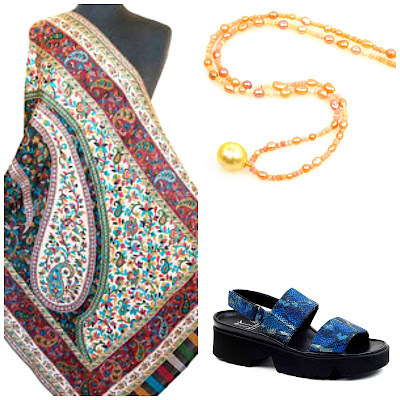 Wear it pinned on a jean jacket or linen shift, it will look perfect anywhere. 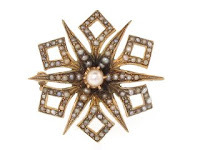 This Art Deco 2-inch brooch is silverplated copper. Though not fine jewelry, this is elegant deco design. $30 from Pierre Bex. This site sells old stock; the company, a darling of costume designers, stopped producing in the '80s. 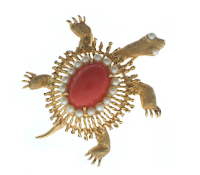 I'm delighted by the whimsy of well-made figural brooches; this mid-century 18k, coral and pearl turtle's a pet. 1 3/4 by 1 1/2 inches, from Beladora II; price, $895. Taller, larger women can wear an imposing 4-inch brooch. A one-inch pin will look lost unless worn on a collar or near the neckline, with a necklace. That's why (you know it had to be coming) pearls and a pin complement each other. That turtle brooch at a collar, worn with pearls, bellissima. Consider size, but also weight. 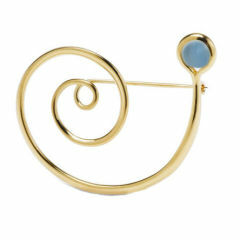 Here's an airy Georg Jensen 18k gold and moonstone Torun brooch ca. 1970, about 1 1/2 inches high by 1 1/5 inches wide. Because of the negative space, it 'floats', making it much lighter than a solid piece. Price, $2,400 from 1st Dibs seller Alastair Crawford. Like a scarf, once you try a few simple placements with your brooch, you'll enjoy its charm and character. Add a distinctive pin to your jewelry basics– pearls, a chain, gold or pearl earrings–and see how it extends your wardrobe. 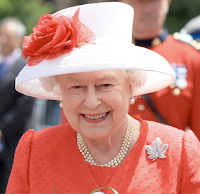 Last Thursday, HRH Queen Elizabeth II, here on a royal visit, celebrated Canada Day (July 1) on Parliament Hill, wearing a stunning diamond maple leaf brooch, symbol of her fondness for the country she calls "my second home". To find your treasure, shop antique or vintage, via shops, jumble sales or your Aunt Susan's jewelry box. The workmanship is superior and you'll find real pieces for the price of current "designer" paste and plastic. How funny, I have spent the last week thinking about a brooch, my jeweler just showed me. The small black and white and small rubies are set on a white gold leaf shape brooch. It can be worn on the hair too. Should I, or should I not. I´ll have to consider this closely. Usually I am very quick in deciding, so.. An interesting post once again. If I´m to buy something, it should be absolutely something new. Nowadays I find myself wearing less and less jewelry. One "hero" at a time, as Imogen calls them. I have a few pins that I inherited and a few picked up when I was young but somehow I stopped wearing them. Perhaps it is time to reconsider. You manage to find the most interesting pieces. I wear a bar pin from my family - pearl and diamonds, very little. At least, when I worked I wore it. Sort of a cross between a military medal and a bit of girlishness. Brooches are just hard because you have to mean them:). Great post! I love brooches, and that Georg Jensen one particularly caught my eye. I find I wear more brooches in the fall and winter because the fabrics lend themselves to being pinned better. My pima cottons and silks don't seem to like being pierced by the sword of a pin. I will pin a filmy scarf if it needs control, but I gravitate towards other accessories come warm weather. Do you find brooches to be season as well? Thank you for choosing this pretty A&C brooch for me! you find the nicest examples of vintage jewelry. I'll have to show you my pins sometime. mardel: Could be fun to bring them out and see how you like them. hostess: As with LPC's, when I post a comment to your blog it is not showing up. Blogspot can burp and I am hoping this rights itself. spacegeek: Yes, but I have a few linen knit tees that hold a pin well- though like you keep them away from silk and fine cotton. I have one brooch that works very well in the summer. It is a vintage clear acrylic pin in the shape of a leaping sailfish and has tiny sparkling rhinestones to set off its scales. It sounds tacky but is really quite nice. I like to wear it on white linen. The clear-on-white makes me think of cooling things like ice or swimming pools when worn during a Southern California heat wave. 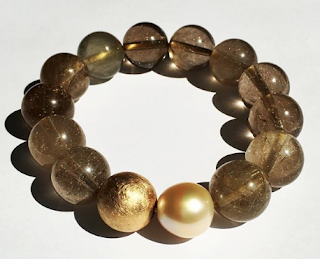 Lovely article on unfairly neglected pieces! I kept a number of beautiful brooches for years but never wore them. Recently, however, I discovered a new method for wearing brooches. Acquire a very high-quality tricolor gold chain with (and this is essential) a sturdy clasp. Then run the brooch pin through the clasp so that you can wear it as a pendant. The effect--especially with the old gold-plated stainless steel brooches of yesteryear--is one of effortless elegance. Another method is to use the brooch as a scarf pin but to treat the scarf as the chain of a necklace--so that rather than wrapping the scarf tightly around your neck, you let it hang loosely (perhaps threaded in an interesting way) and then tie a knot at the extreme end to which you can pin the broach. This gives the look of the fabric-enhanced necklaces that are so in vogue now. That strategy works especially well with some smaller square scarves (gauze or silk) or long and very thin scarves (though those you may need to double around your neck with a raven's head knot). Of course now, selfishly, I *don't* want others wearing brooches--I've started to think of this as my signature look. J.W. : I'd covet your brooch. Still dream of an enamel and diamond swordfish I didn't buy (v. pricey) but so perfect in summer. Fish, shells, flowers all look delightful in summer. Anon@ 2:10: Thanks so much for the detailed instructions. Intriguing what you are doing with the scarf. Fabulous post and thank you for the link. I do love brooches and I wear them both with fancy outfits and casual jackets. They are so much more interesting than the average necklace. Here's my idea, though I have not done it yet, for dressier occasions when I feel a brooch on the dress would be too much: I'm on the lookout for a padded plain black or other color headband (hopefully in a nice fabric like velvet or silk moire)that I can pin the pin to so that it is just left or right of center. Sort of a tiara without being a tiara, I think. I love the look of a large abstract brooch, but I wear t-shirt-type knits most of the time, and the pin back would damage them. Sigh. Belle: Yes, and your site is a trove of delicious ones! Usually less than a necklace and more versatile (see tomorrow's post). Toby: That grabs my imagination, it's sort of flspperish. Fun for a wedding or garden party. Sue: You can have the pin replacde on many older brooches to something finer. Or try linen knits. We brooch lovers actually buy out tops to accommodate our pins. Of course a lot of people laugh at "Queen outfits" and the over-the-top hats, but I thought Her Majesty looked very nice indeed in her red outfit. Love, love, LOVE Toby's idea (posted above). Thanks! I have to say, though, Duchesse, that I will always love my costume jewelry...those who know me know it is always quite tongue-in-cheek...those who don't will just have to believe I'm tacky! But it is still lovely to see all the photos of "the good stuff"! Love your blog, but may I say gently that Queen Elizabeth is not an HRH, but HM ie Her Majesty - HRH being the province of princes and princesses rather than the reigning monarch ... and she is not (just) the Queen of England as popularly described... Again, a gentle observation rather than a criticism of your wonderful article on brooches.